Q: How do you build the secure data centre? Let me explain. Traditionally you might have approached any big IT project from the infrastructure level, but increasingly the IT agenda moves away from simply setting up the hardware. 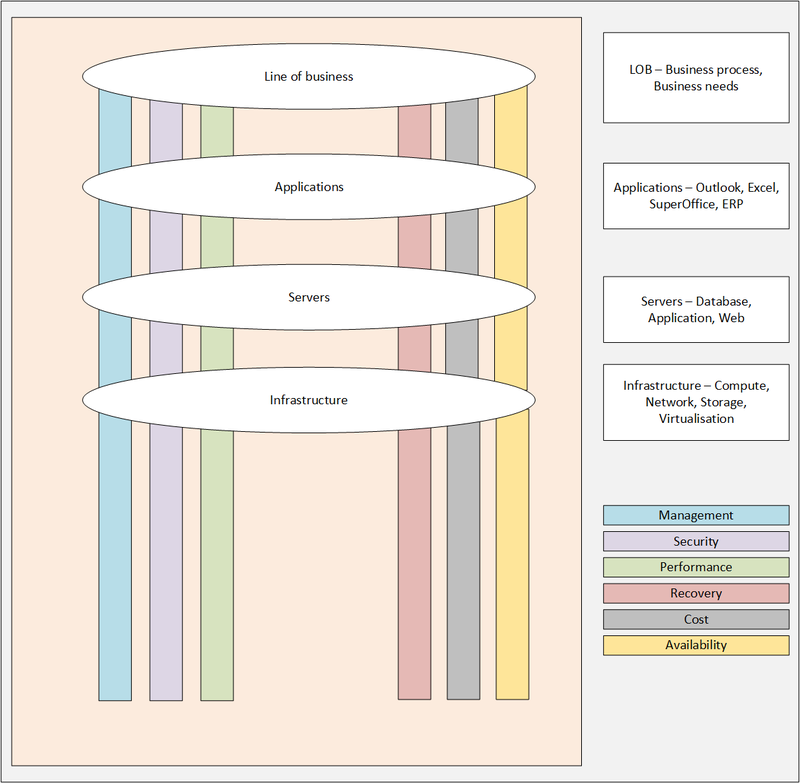 Working up the stack, it's about the systems supporting your applications, the applications supporting your users, and the users themselves. I've put together a diagram to give you a better idea of what I'm talking about. At the top we see the business process; below it we have apps such as Office, email and your own software which together enable your operations, then further down we have the servers and core infrastructure that underpin it all. Look to the right, and you'll see that I've added six pillars, each of which applies at every level throughout the organisation. Taking security as our example, this means that you aren't just considering it when it comes to the location, design, redundancy and backup of your data centre. Security should be inherent to your hardware, software, services and application design. Also it's fundamental to your business processes, and the way you hire, train and manage your staff. What are the app and database servers needed to make the systems work? What are the compute and storage requirements? What about backups, redundancy, and issues like data sovereignty? It's only with this wider discussion, and the fuller picture it gives me, that we can get to a common understanding of what good looks like. By considering security in the context of the full range of business needs, we can ensure we're designing and building the best possible data centre infrastructure, and not looking at security in isolation. So, to answer our own question, how do you build the secure data centre, we say “don't start with the data centre”. Talk to us about how we can work with you to optimise your data and application requirements, and we can work with you to design the required infrastructure in an innovative and cost-effective way. Security will be one of your needs, but there will be many others, and we can help with all of them. If you want to talk about your data centre and infrastructure requirements, call us on 01273 957500.